Here in the high desert, we do not get precipitation very often. If it does rain, I try not to ride in it. Not because I am afraid of getting wet but because as someone who also drives, I know that visibility can be more difficult--especially from the inside of a car. The roads can also become more of a hazard when the rain water makes the oils bead to the surface, making the asphalt slick. If you get caught out in the rain, there are some things you should keep in mind so that you can have an enjoyable but safe experience. You'll also find some stylish shoe covers to keep those stiletto heels dry! time I realized the rain was coming down harder, it was too late to catch a ride in the car with husband. Fortunately I have a nice rain jacket to keep me dry. And my Novaro pannier bags also have rain jackets to keep the contents dry. And so I rode to work. You know how riding a bike can make you feel like a kid again? Well riding in the rain makes me feel like a kid in a candy store! Splashing through the puddles. The rain kissing my face. I LOVED every minute of it!! Ducks in the river playing in the rain. Even the ducks frolicked in the river, despite the rain! 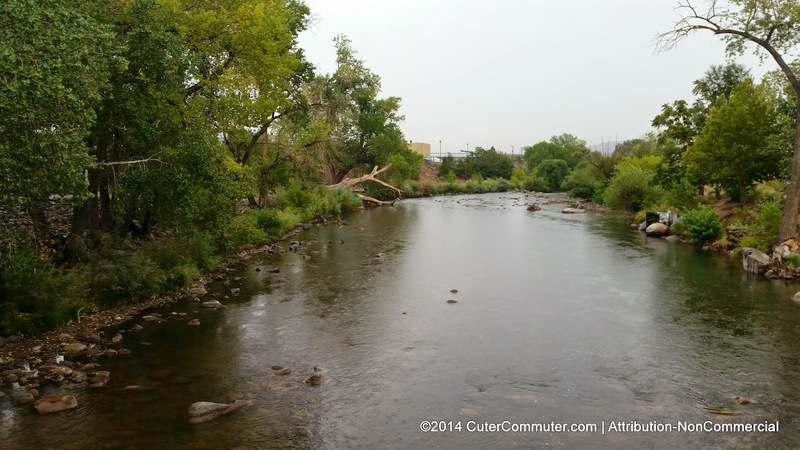 I have noticed the water level on the Truckee River is a lot lower than it used to. Lately it is more like a stream than a river. 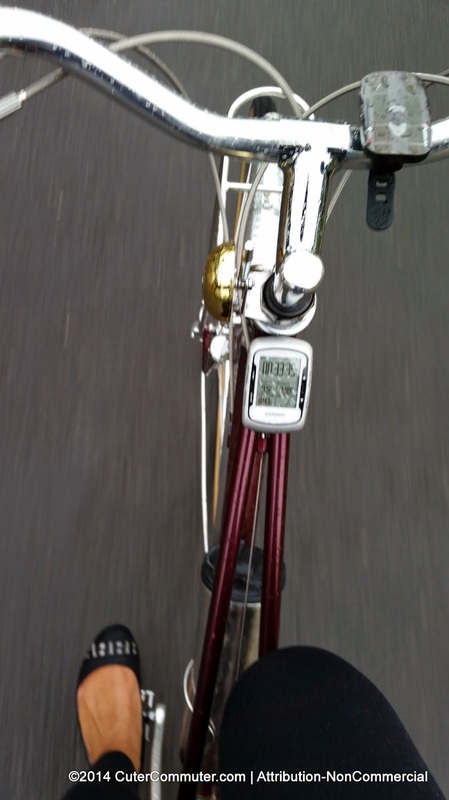 I am thankful for the fenders on my bike. They kept the mud from splashing onto me. My bike, on the other hand was a muddy mess by the time I arrived at work. It will need some tender loving care tonight! As for me, I arrived at work dry. And as usual with a smile on my face. It's not often that I get to ride in the rain. It seemed a little scary at first because I am used to riding in dry, optimal conditions. But once I got going, I realized how much fun it was to ride in the rain. I am not a wet-weather riding expert but here are some thoughts to keep in mind if there is rain in the forecast or if you get caught riding in it. 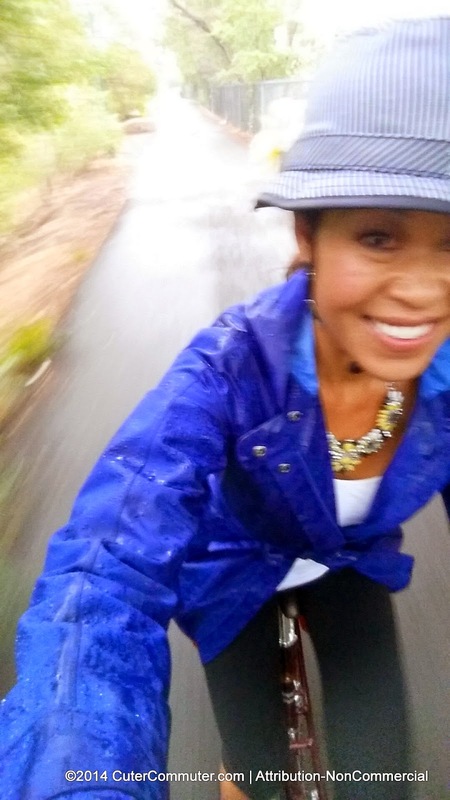 Active.com also has these great 10 Tips for Riding in the Rain. Be seen. Have the front lights on, rear lights on of your bike (mine are always on whether it's a clear or cloudy day). Wear bright clothing. 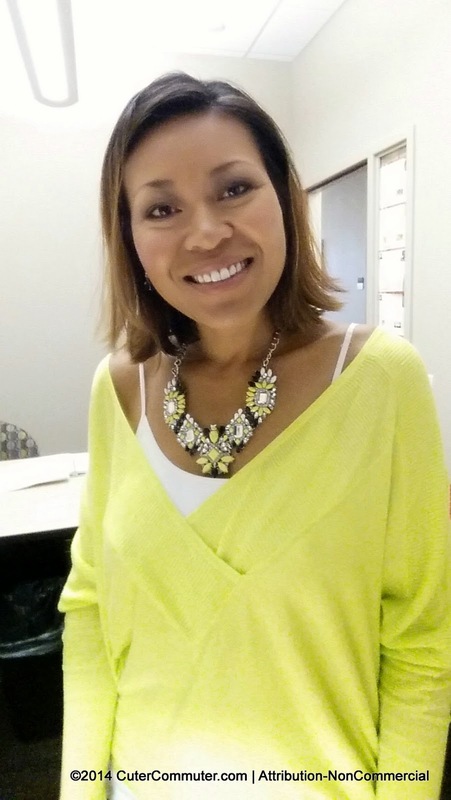 I started out wearing a chartreuse dolmen sweater but then got hot underneath my jacket and stopped to slip it off. Ride slower and always in control, especially as you approach driveways and intersections so that you can stop. 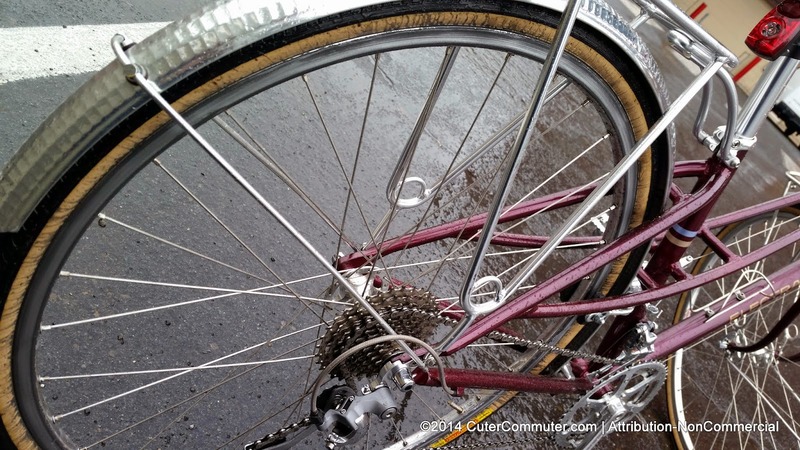 Bicycle brakes do not work as well in the rain so give yourself extra time to stop. Take caution when turning, especially when going over white paint such as those at crosswalks. They can be very slippery. Make sure your rain jacket does not cover up the rear light of your bike. When I sit down on the seat of my bike, I sit on my jacket to keep it from draping over the rear light mounted on the seatpost and to keep my bottom dry. Try to take streets with less traffic and with slower speed limits. It may take you longer to get where you need to, but you will be safer and reduce the risk of mishaps. I am fortunate that my route already has low traffic with slow speed limits. This means I most likely will not get splashed when cars whiz by. And on slower streets people who drive will have more time to see me which means more reaction time. 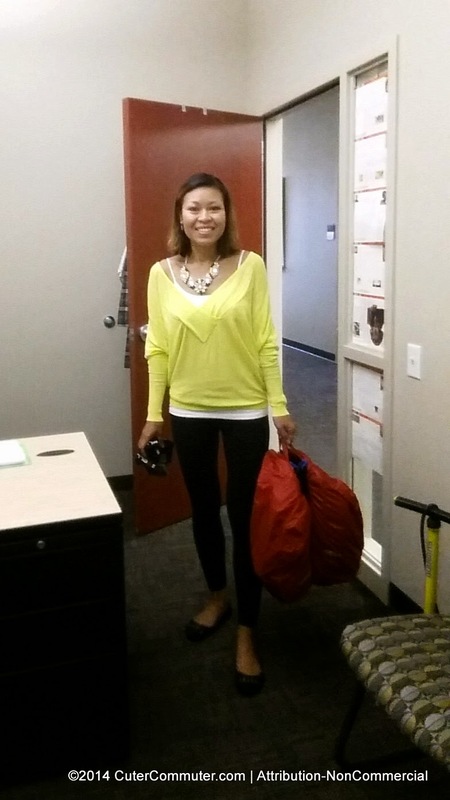 Pack extra clothing (socks, shoes, etc.) to change in case you get soaked. I didn't need to because my tights and flat shoes dry pretty quickly. I also keep extra socks, a button up shirt and camisoles in the office. Some bicyclists wear rain paints to keep their legs and bottom dry. You can also wear gators or these stylish shoe covers (they makes ones that cover ballet flats too!). Lucky for me I do not rely on wearing glasses to enhance my vision. But if you wear glasses, I've heard that it can fog up. 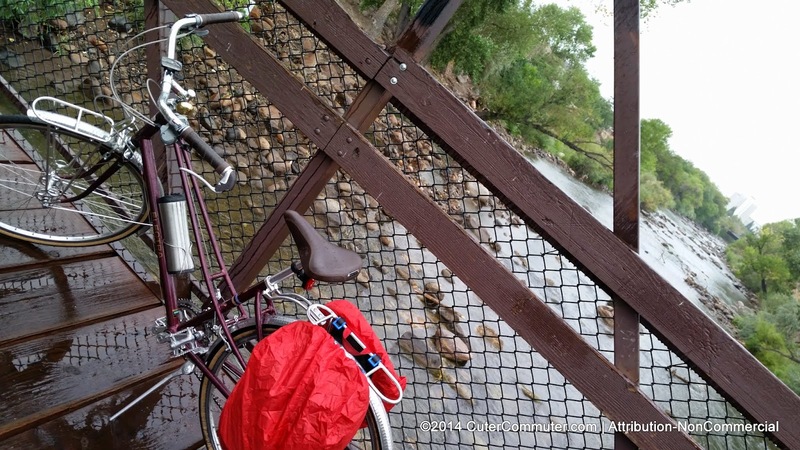 One blogger posted a DIY bike rain visor from a soda bottle! I am sure I have forgotten other things to keep in mind when riding in the rain. If you can think of anything, please post in the comments! !